Shows how Muslims, Christians, and Jews together built a sophisticated civilisation that transformed the Western world, even as they waged relentless war against each other and amongst themselves. A senior Arab diplomat writes to his sons about freedom, faith, violence, culture and society, the challenges of the modern world and his fear of radicalisation. A clear call for critical thinking, this takes up the challenges facing modern Muslims around the world, especially the young. At the heart of this humane and compassionate set of letters is the author’s concern for his sons in an age when moderate voices can be drowned out by vociferous – and belligerent – claimants of authenticity and legitimacy. Ghobash’s hope is to assist his sons to become “thinking, ethically directed young Muslim[s]” by helping them cut through the noise and strife to reach their own reasoned judgements. “There is much more gray in between the black and white that the ulema and other scholars present us. And the gray is where you develop intellectually and morally. The gray area of uncertainty and doubt as to what is right and what is wrong is where you discover your own right to think for yourself and to participate in the construction of our ethical world in practice. ” Ghobash, whose own father was assassinated in 1977, has produced a book that is as moving as it is powerful, direct and clear. 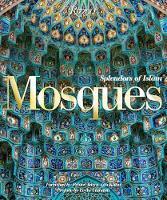 Illustrates the development of the mosque’s basic structural and decorative elements through sixty examples, including the most venerated, up to the present day.